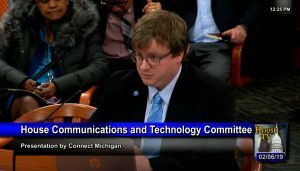 Lansing, MI (February 6, 2019) – Michigan lawmakers got an update on the issue of broadband access in the state today during the House Communications and Technology Committee meeting. Connect Michigan’s Executive Director, Eric Frederick (pictured right), was among those who testified. Connect Michigan is a local subsidiary of Connected Nation, a national nonprofit working to find innovative solutions to expanding access, adoption, and use of broadband and its related technologies to all people. Frederick gave committee members an overview of internet connectivity in the state and what’s being done to improve it. In addition, Frederick pointed out that the USDA has recently launched the ReConnect Program to fund rural broadband expansion. The USDA also released a ReConnect Toolkit today to help communities interested in taking advantage of the program. Because Michigan has a plan in place, projects are automatically weighted stronger when submitting applications for grants and loans. Frederick provided a presentation in support of his testimony. 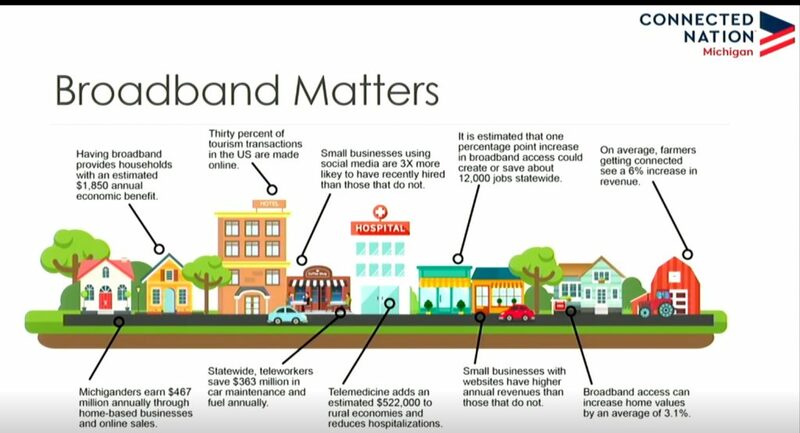 It includes an overview of what can be done to reach unserved areas, why broadband matters, and details on the state grant program. You can download this presentation by heading to this page.